4.9 (Based on 17 Reviews) 100% of reviewers recommended this product. Very pleased with this eyepiece, which is now one of my favorites to use with my Celestron f/10 6" SCT. I strongly recommend it and am considering purchasing others in this line. I just bought the 15 mm and 8 mm (my Plossl 25 mm is still acceptable). They are strikingly good, sharp across the field, excellent contrast, no significant chromatic aberrations, and the equal of EPs at a much higher price. The eye-relief adjustment works very well. Plus, solidly made (I like the substantial heft!). Can't beat 'em! I did a lot of reading about eyepieces and these were mentioned in a few articles as being great value. They seem to be just that. I purchased this and the 25mm version for an inexpensive Dobson scope. They were much better than the eyepieces that came with the scope. When I move to a more expensive telescope, these should continue to serve me well. One of my first premium eyepieces and the difference was striking. These EPA are highly regarded and often recommended across popular forums and owning one makes the reason for their popularity obvious. Another great Agena product and an outstanding eyepiece in this Starguider series. This has become my goto eyepiece, just right for most viewing. I like the adjustable eyecup a lot. A very comfortable eyepiece. Hi, I got into Extra Low Dispersion Glass when I got a new refractor. So when I saw these ED eyepieces for $60 I decided to try one. I liked it so much I collected all but the very high power (the 2.3mm I think). Anyone would be pleased by these eyepieces. The 18mm also works great in my 50mm finder scope. They work great in all my scopes from F-5 to F-10. The 18mm had some black outs in my F-5.9 80mm refractor. It's a very short refractor. I had no problems other than that. Great eyepieces! Good Luck! BY! I was looking for an eyepiece between 9mm & 26mm power for my ETX125 scope. The eyepiece is very well made. Sharpness is great and the FOV is great over basic eyepieces. I am very happy with this purchase and the 15mm Starguider makes a great addition to my collection. I was impressed with the view of Jupiter and the sharpness of it's moon with the Starguider. 5.0 Fine eyepiece. Excellent value. I purchased this primarily for birding with an 80mm refractor, but decided to give it a try at night in an 8 inch Schmidt Cassegrain scope. Viewing the first quarter moon with just average seeing conditions I was able to see tiny craterlets at about 130x. The moon looked sharp all the way to the edge and the eyepiece did not add color fringes to the lunar limb. I also tried the eyepiece on Castor which was a very easy split, as well as several closer doubles which it handled well. Although I have no TeleVue or Zeiss eyepieces with which to compare this eyepiece, I would guess that for any but the most serious observers with very expensive equipment and years of experience, the differences would be marginal. For the average viewer who wants a very good eyepiece at a decent price, I highly recommend this product-at least the 15mm which I have tried. Review by twogear of Virginia. 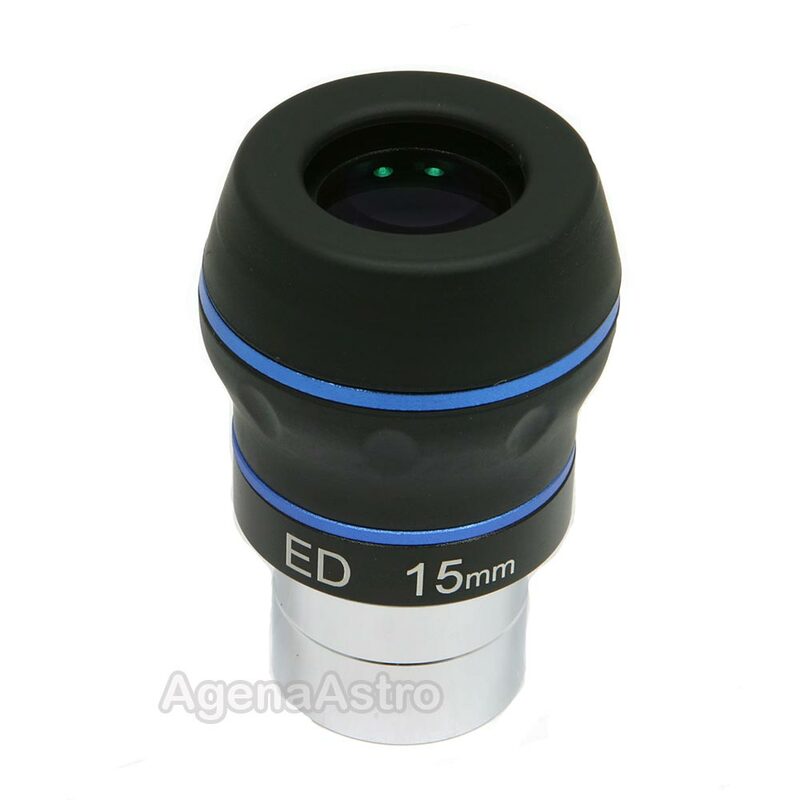 This is the best 15mm eyepiece for under $100 that I have used. I love the wide-field of view and crisp images. In my 90mm F10 refractor this eyepiece brings me a lot of joy. Our moon (in nice detail), Jupiter and it's glorious diamond shining moons along with Saturn. Add a 2X barlow and bands start to appear on our closest jovian planet and the rings on the next. I use this with my 130MM fast F5 newt also. A little astigmatism around the edges but the objects on this piece of glass stay centered because I cheat and use a goto mount. LOL. If you want a good eyepiece without breaking the bank you won't be disappointed. Review by Zach of Tulsa, OK. I use this eyepiece with my Orion XT8 Reflector. It seemed like a good magnification by itself, with a nice wide field of view for finding objects and viewing DSO's. With a 2x Barlow, I'm able to make out the details on Jupiter, Saturn, etc. As a wearer of eyeglasses, I appreciate the good eye relief, and I have no problem wearing glasses while I observe with this eyepiece. Using the Dobsonian mount with this one is nice because the wide field of view (and relatively consistent image regardless of angle) mean that I have to shift the telescope less frequently. Couple all that with the low price, and this eyepiece is quite nice for me! Excellent eyepiece. Can't go wrong with these. Great value. Review by CloudHater of La Habra, CA. If you're trying to graduate from cheapy lenses, this is definitely a few steps up. You will notice the craftsmanship of the clever eyecup. Give it a twist. Better on brighter objects as well. No need to spend 2X or more. Review by Bryan of Northeast US. Very comfortable eyepiece that is a step up in every way over a standard Plossl. Easier and more comfortable to use, wider field and sharper view. Reasonably priced upgrade from entry level eyepieces.